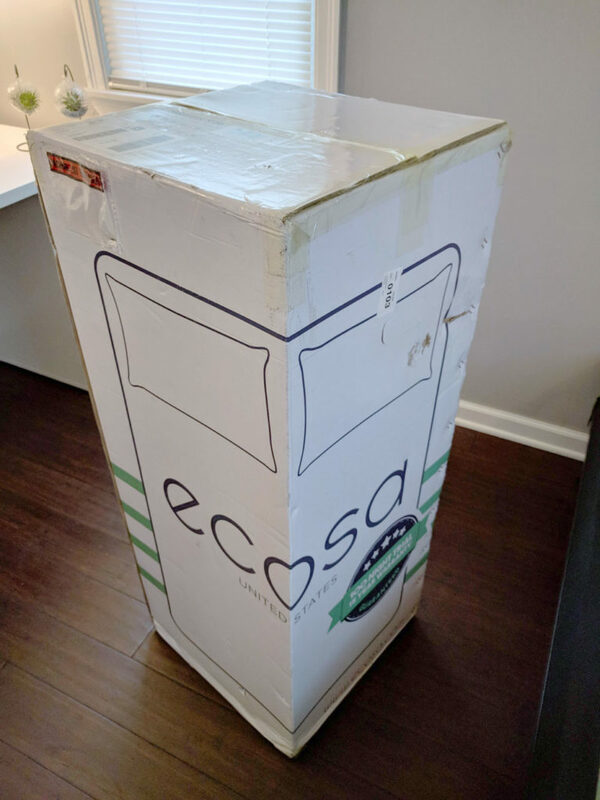 Ecosa sent us their value priced bed in a box option. We were excited to review their adjustable firmness options. 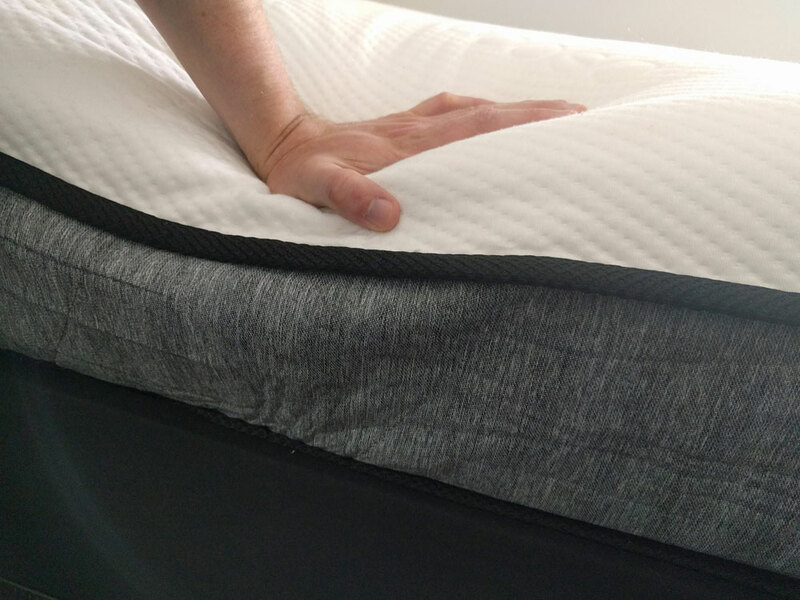 Simply flipping the order of the layers of foam in the mattress change your comfort levels from a medium, medium firm to a firm. The Ecosa is lightweight and maneuverable, with free delivery and easy setup that requires minimal time and effort. 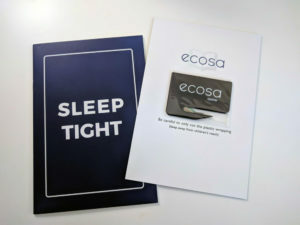 Where is the Ecosa Mattress made? Ecosa mattress was established in 2012. Early success in Australia has allowed the company to expand their business into to US market.Ecosa’s ownership is based in Australia but, their factory operates in China. Approximately 90% of materials used in production are imported from Germany. The remainder is acquired from Japan and China. What type of mattress does Ecosa make? 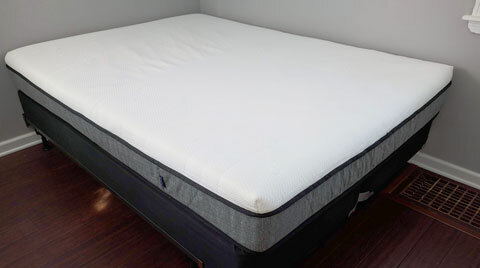 Ecosa is produced using a combination of high density memory foam and specialized support foams. It’s designed to be a supportive but, pressure relieving bed. Ecosa was quick to share with us their product specifications. Transparency is extremely important when evaluating and comparing competitive options. We always appreciate when a manufacturer is willing to share their specs as it generally reveals their confidence in build quality. 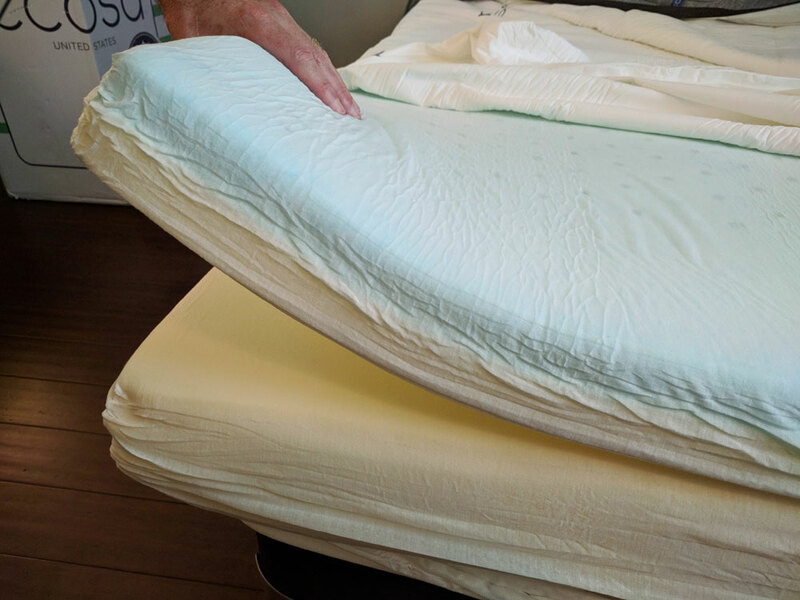 1.5″ of 3.75 lb density gel Infused memory foam – This foam is denser and better quality than many foams used in similar priced mattresses. It’s designed to create pressure relieving conformity. Cooling gel regulates sleep temperature and is made primarily from plant based materials. Put this layer on top for the medium configuration. 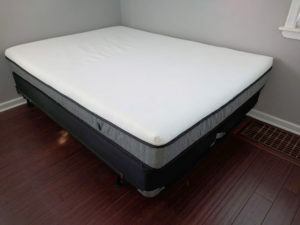 .7″ of 4.3 lb density open celled ECO-TEX foam – This is a quality foam that exceeds even some higher priced mattresses. Put this layer on top for the medium firm configuration. 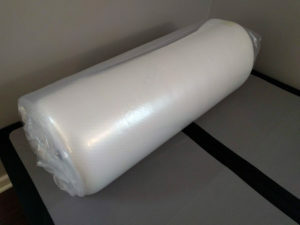 7″ of 1.99 lb density support foam – This layer provides extra stability and bounce. Put this layer on top for the firm configuration. German micro-filament cover is 100% waterproof but still remains breathable. It offers great protection against dust mites. Ecosa mattress meets CFR1633 Fire Retardant standard certification by using chemical free methods. A woven silica sock sits just under the outer cover. In the event of a fire, the silica sock melts and chokes out the flame. Ecosa mattress meets strict health standard guidelines such as CertiPUR-US, OEKO-TEX Standard 100, ISO9001 & CFR1633 fire retardant. All suppliers are required to have 14001: 2004 certified management systems in place in ensure environmental safety. In addition, plant based materials are used whenever possible. Ecosa mattress meets CFR163 fire retardant standards by using chemical free methods. This mattress has been proven to not release dangerous toxins into the air. It means you can buy with confidence that Ecosa is safe for you and your family. This mattress uses dense quality foams that provide substantial support appropriate for its price range. Ecosa’s contouring ability falls short of many comparable springless mattresses. Even the medium configuration is still quite firm. While this is typically a strong area for memory foam mattresses, Ecosa’s performance was a bit disappointing. We noticed much more sleep partner disturbance than expected. There’s not a significant amount of sinkage in this mattress. For an all foam mattress, ease of movement was better than expected. Keep in mind that all foam mattresses will retain a certain amount of heat. Ecosa’s cooling gel memory foam and breathable support foams are designed to regulate heat and keep you cool. All foams used are CertiPUR-US, OEKO-TEX Standard 100 certified to not emit toxins in the air. Although it posed no danger, we noticed a musty scent when the mattress was unpackaged. This scent lingered for some time, even when left uncovered. Ecosa is only a 10" mattress but, it uses relatively dense foams. Expect to get your money’s worth when it comes to durability. Edge Support is typically a weak point among foam mattresses. This is a characteristic of springless beds and a trade off for their unique feel. Once laying down, body weight is dispersed evenly and does not affect overall support. Ecosa offers a 100 day comfort trial. While there are a hand full of companies offering longer trial periods, We believe 100 days is a more than adequate to decide if this bed is right for you. Free delivery to your door. No in home setup is offered. The Ecosa is a bit more appealing in this category than most foam combo mattresses. Its firmer feel and push back make movements easier. Although it does not have the same bounce as a latex or traditional coil spring mattress. At the current price of $699 for a queen mattress, Ecosa is a solid value. Quality materials, solid warranty and adjustable firmness levels are unique to beds in this price range. If you are looking for a firmer than average bed the Ecosa may be for you. We would have rated this mattress higher if it had a broader and softer comfort range. We find that most other mediums mattresses are much softer than the Ecosa. Even at its softest the bed is much firmer than a typical medium mattress. The Ecosa mattress has the unique ability to offer 3 firmness levels in one bed. We evaluated each to be firmer than it’s stated firmness level. The firm is designed to have the least amount of body hug and give. You can attain this feel simply by rotating the bottom layer to the top. This is a rather robust firm that we would consider more of an extra firm. If a rigid extra firm feel is your thing, this is a solid choice. We found the medium firm to feel more like a traditional firm. Again, not a bad feel, just a bit firmer than anticipated. While softer than the two other options, the medium, had the feel of a medium firm. Still, this option will probably appeal to the widest amount of sleepers. The Ecosa offers a range of relatively firm feels that should accommodate most back sleepers. Those who prefer this position tend to gravitate towards firm to medium firm; depending on your physical size and comfort preference. Most back sleepers should be quite comfortable on one or more of the Ecosa’s comfort options. Ecosa will be soft enough for some, but not all side sleepers. If you’re seeking deep body hug or have pressure sensitivities, Ecosa is not for you. Those seeking a softer feel to accommodate the shoulders and hips should search elsewhere. Most stomach sleepers will find their comfort zone with the Ecosa mattress. This position requires enough firmness to keep your back from dipping; causing lumbar pain. Ecosa’s 3 available options are all possible solutions. Body type and comfort preference will determine which one. 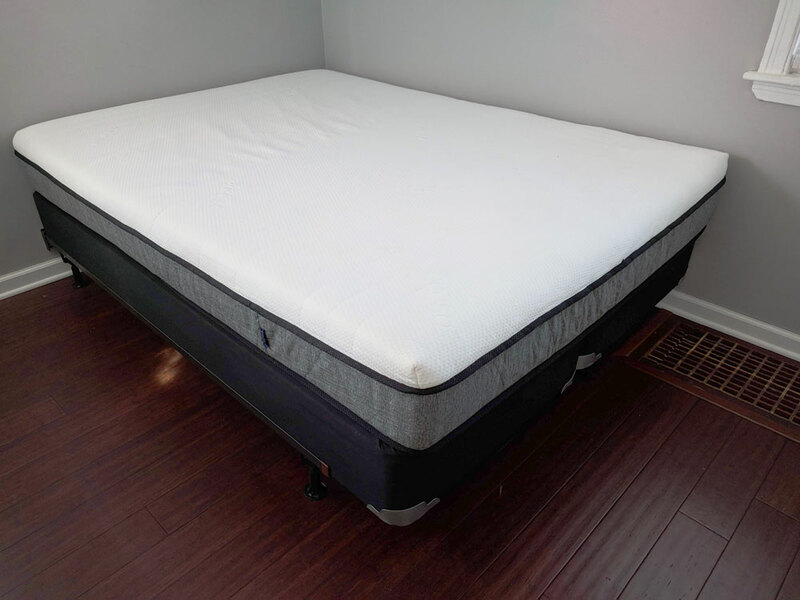 3 firmness levels in one bed: Simple adjustments allow you to change your mattresses firmness/comfort level. 15 year warranty: This warranty is twice as long as industry average. Sleeps cool: Like most modern memory foam mattresses, Ecosa utilizes cooling gel to offset previous issues with heat retention. Natural latex and coils spring options are still cooler. However, unless you sleep hotter than most, this mattress should sleep cool enough. Dollar value: If you are set on getting a firmer than average mattress the Ecosa mattress offers decent quality for the dollar spent. Comfort restrictions: The medium, which is the softest arrangement, may still be too firm for some side sleepers. Edge support: Like most memory foam options, the Ecosa mattress does not provide the same degree off edge support as a coil spring bed can. This is a characteristic of all foam beds. That’s not a flaw but, certainly something to be aware of. If you are a back or stomach sleeper you will appreciate the Ecosa mattresses range of firmness options. You can arrange the layers of your bed to create a medium, medium firm, to firm comfort level. Those concerned about dust mites will benefit from Ecosa’s unique waterproof liner that keeps moisture and skin particles away from your support foams. Ecosa also has a removable, washable outer cover. Bargain shoppers will get a quality product at a great price. Ecosa’s foams are are dense and supportive. Side sleepers seeking maximum pressure relief may find the Ecosa mattress too firm. The medium arrangement is the softest option available. It will accommodate some, but not all side sleepers. This is especially true for those with severe pressure sensitivities. If you are sensitive to odors Ecosa may not be for you. We noticed a rather strong odor that lingered for the week that we tested it. We recommend leaving this mattress uncovered during the day for as long as possible for the scent to dissipate. Those seeking strong edge support will will fare better with a traditional coil spring or hybrid. 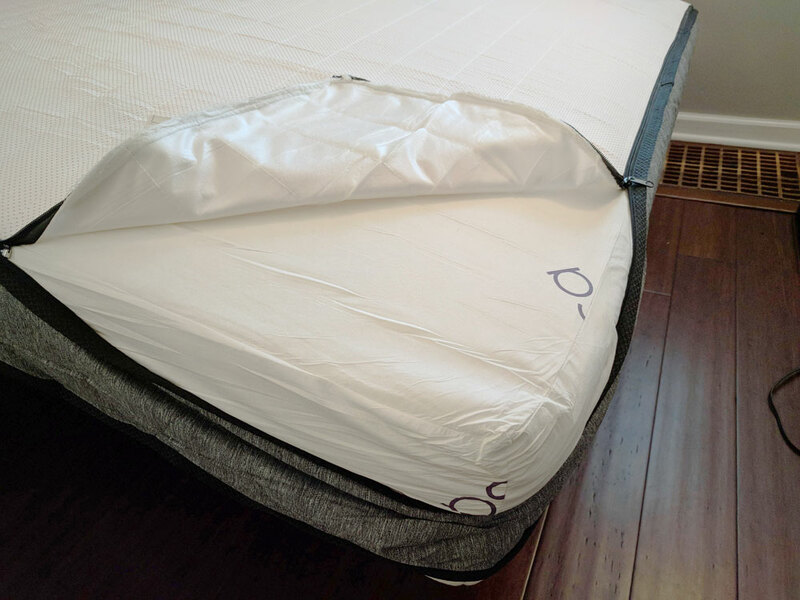 The Ecosa mattress weighs approximately 75 pounds. Although one person can assemble this by themselves, it’s much easier with a second set of hands. Once the mattress has been moved to the bedroom, the next step is to remove it from the box and lay it on your foundation. Then carefully break the plastic seal; being cautious not to damage the fabric. A special cutting tool is provided for this purpose It will expand rapidly but still need time to decompress and aerate. Although you can lay down on your bed right away, the Ecosa will expand fully in a few hours. Colder outside temperatures can affect this duration. Memory foam is heat sensitive. Your mattress may require a bit longer to soften and take shape when delivered during winter months. Note: It’s important with any queen or king size bed to have a frame with a sturdy center support and additional legs on the ground. Over time, Inferior frames can affect the support and longevity of your mattress. 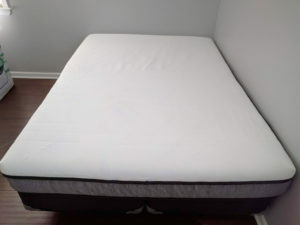 The Ecosa mattress uses quality foams and has some unique features such as the adjustable firmness, waterproof liner, and a removable, washable cover. This mattress is priced exceptionally compared to similarly specced mattresses. We found the actual comfort feel to be firmer than the competitors we’ve tested. Our assessment is based on this mattress being quite firm; even when set to the softest arrangement. Our concern is that Ecosa may be too firm for many side sleepers. Your impression may vary depending on your body type, preferred sleep position, and personal preference.